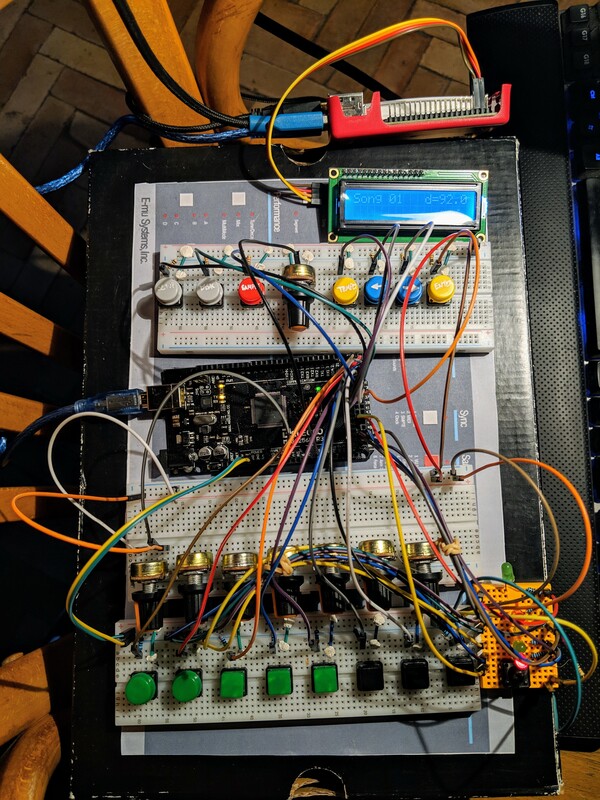 I'm a software engineer with very limited knowledge of electronics and I have started re-creating my favourite sampler/drum machine/sequencer from the 80's using an Arduino & Raspberry Pi. That machine is the Emu SP-1200. If you're not familiar, it's a legendary sampler with a very particular sound and a cult following even to this day. It was designed by Dave Rossum which some of you in the synth & eurorack world may know for other things. As a fairly long-time user, the two most appealing things to me are the ease of use and intuitiveness of its interface, and its very specific sound and character. Some of which is due to the way it interpolates samples when tuning them up/down, and some due to its analog filter (SSM2044), 12bit AD/DA (AD7541) and output stage. Most of the original components are now discontinued, except for the SSM2044 VCF which has been reissued and slightly updated in the form of the SSI2144, in partnership with Dave Rossum. I'd like to try and include this filter in my project. Would it even be possible to implement this filter in my circuit considering the Arduino & RPi take 5v power but the filter requires 12v? If not can you suggest a good alternative? How do I figure out how to wire the pins of the filter? Any help and feedback will be much appreciated. It would be best to have an analog output section powered by a bipolar +/-12 volt power supply. You can generate you 5v supply from the +12 if you like. Feed the DAC output into the filter/ output circuitry AC coupled or offset so it’s bipolar +/-5v or so. Very very cool project. I love the SP1200. It really does have quite a distinguisable sonic character. You are going to use the 12bit AD/DA and output stage from the original right? If you're going to be going as far as spinning a board for this, I would just put a +/-12V rail on there and be done with it. Thank you for the kind words . If I can source the parts and understand how to implement them I'd definitely love to. Even if I can't find the original AD/DA i will try to find a good 12bit one. But yeah as you can see my electronics skills don't extend much beyond basic breadboarding of switches and pots. Half the charm is in the ad/da. As you say it, the other half comes from the pitch algorithm that paired with the converter results in those artifacts. I am not sure it is the filter, have seen people going to extremes trying to bypass it altogether. My two bits right here on this very special project. I definitely agree, I almost never use the 2 filtered outputs either, even after adjusting the timpots inside to try and get a higher cut-off. But lots of SP fans seem to make a big deal about it. From what I can see, they are just using good old TL084s for all the channel outputs. You could easily recreate this circuit (see page 84 of the PDF). The DAC is a AD7541 which you can also easily still buy. For power, you will want to decide if you wish to power your device from an external power "brick" or AC. If you do the former, you can certainly find some units which provide +5/-5 and +15, which is what you'll need (don't worry about the +12V as if I read the schematics right, it's only used for the floppy disk drive). If you want to use AC, you'll just need a transformer, rectifier, voltage regulators, and some filtering caps. The schematic for the original PSU is on page 87 of that PDF. Good luck and excited to see how this project goes! @devinw1 thank you so much, you just clarified a lot of things for me. I can definitely go with a power brick. Glad to know the outputs and dac are still available, I couldn't find them with a quick search. how much current does the pi draw these days? I'm a software engineer with very limited knowledge of electronics and I have started re-creating my favourite sampler/repeatdrum machine/sequencer from the 80's using an Arduino & Raspberry Pi. Great project, recreating the well thought out and functional interface saves a lot of time trying to rethink it, you can add enhancements once its all working. For recreating the sound there isn't any interpolation of the samples, it repeats or drops samples at a constant sample rate which adds aliasing or imaging of the original waveform. That forms most of the characteristic sound, the second part is the DAC which isn't just a single 12bit converter but a 12bit DAC multiplied by a 10bit DAC driving 8 output channels interleaved in time. Both of those effects on the sound can be easily calculated/emulated in software on a modern fast processor and you can output the result on a modern DAC. Then pass that through the analog filter if desired. The output circuitry is quirky and you can just recreate it exactly from the original, it uses +15V and -15V to power the filters and analog parts. Still cracking up about your awesome DC shoe box enclosure proto. Reminds me of the new Nintendo Labo stuff. Would be kind of hilarious and awesome to offer an engineered flat pack cardboard SP-1200 DIY kit. @Mungo Thank you for the insight. Do you have any specifics on how the tuning algorithm drops & adds samples? Someone did an amazing job at reverse engineering and modeling it about 10 years ago but shelved the project and the code was never released. He did however publish some of his process here, along with sample comparisons between the real SP and his emulation which were virtually identical. Can you recommend any good resources on DSP that would help me understand the maths behind the algorithm? Its almost all written out in the service manual, a very detailed explanation of how the samples are played back from the memory. The logic is directly applicable to a modern microcontroller/CPU unlike some of the other samplers of the era. Sounds like your making good progress already. Once completed might this project be released as a kit à la Syncussion / TTSH clone etc.? If you do make a SP-1200 DIY kit, I 100% will buy one! Always nice to see a fellow frenchy working on a project like this. Unlike many knowledgeable people here I can't help with technical qustions but I will follow developments on this... I'd love to build myself an SP like sampler. The project is definitely making some good progress, both on the software side and the hardware side, thanks to the help of a member here (not sure if I should mention you or not). The pitch-shifting algorithm has been reverse engineered, and the results sound extremely close to the real thing. I posted a blind test in an SP-12/1200 user group and most of them were fooled and couldn't say which was the emulation. And that's only with the pitch shifting, with a bit of work on modeling the frequency response of the SP's outputs it should get almost indiscernible. I also got a comment from Just Blaze, producer for the likes of Eminem, Jay-Z and Kanye West saying he wants one when it's done, which was pretty surprising. The DIY kit option is under consideration, ideally I'd wanna do both assembled units and DIY. Great project. Am firm believer in the 'magic' sound of old samplers. I had an Ensoniq eps16+ for many years & always loved the sound of it. Wish had kept it and repaired it. I have always been convinced that other samplers (but never tried emu) and software are completely missing the magic it had. 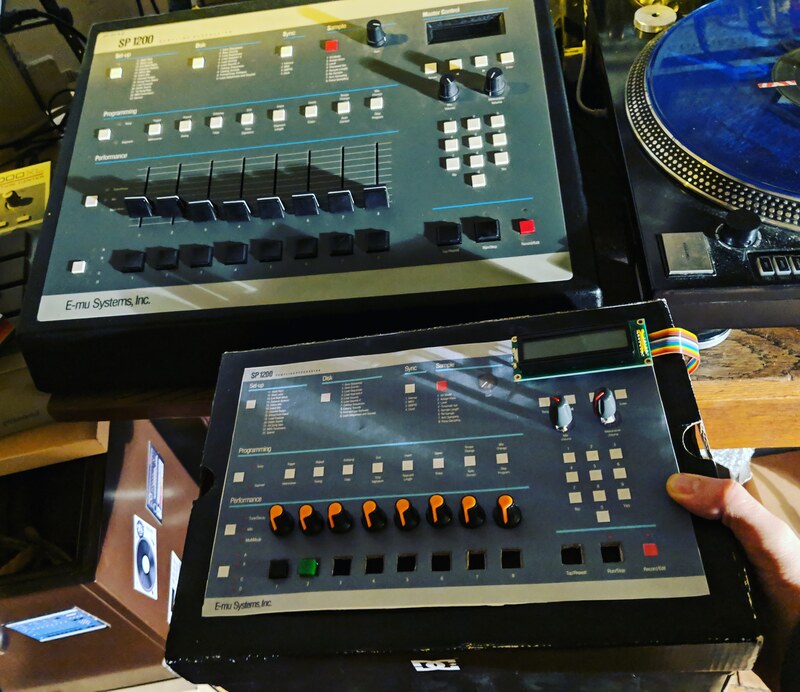 Glad that you are recreating the magic of the SP1200. Good luck am watching with interest. Thank you for the kind words. The technique of speeding up the record and then pitching back down after sampling is a big part of what makes the SP-1200 sound like it does. At nominal pitch it actually sounds pretty clean. I know for a fact Ensoniq did use the same pitch shifting algorithm as the SP on some of their chips, but I don't know exactly which models have it, it's very possible the EPS was one of them. I definitely agree about the magic of some vintage samplers, it's something not many people seem to recognize or know about. My other favourite sampler aside from the SP-1200 is the Akai S950, a really great sounding 12bit rack sampler with an awesome Butterworth filter (the MF6CN-50), LFO and a primitive time-stretching that sounds very special and was used in a lot of DnB.